Members of the SLC4, SLC23, and SLC26 families of secondary transporters are widespread over the human body and perform critical roles in solute translocation. Malfunctioning of selected family members is associated with diseases. While the three families do not share any obvious sequence identity, recent high-resolution protein structures revealed an identical and novel fold composed of two inverted repeats of seven transmembrane segments. Our mechanistic understanding of how this fold facilitates transport is limited. In addition, the role of the cytoplasmic STAS domain, a unique feature of SLC26 proteins, in modulating transport is not clear. A detailed investigation of the structure, function and dynamics of members of the SLC26 family and comparison with the other two families part of this structural class will highlight how general the design principles are in this fold and reveal their plasticity towards adopting additional regulatory domains. The potential transport mechanism and substrate binding site of SLC26Dg. Left panel: side view of SLC26Dg illustrating the expected relative reorientation of the core domain underlying transport. 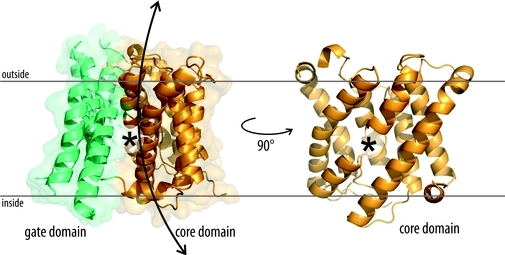 Right panel: side view on the core domain indicating the proposed substrate binding site between the interrupted alpha-helices of transmembrane segments 3 and 10. Substrate is represented by a black star. Geertsma ER, Chang YN, Shaik FR, Neldner Y, Pardon E, Steyaert J, Dutzler R (2015) Structure of a prokaryotic fumarate transporter reveals the architecture of the SLC26 family. Nat Struct Mol Biol 22, 803-8. Ehrnstorfer IA, Geertsma ER, Pardon E, Steyaert J, Dutzler R (2014) Crystal structure of a SLC11 (NRAMP) transporter reveals the basis for transition-metal ion transport. Nat Struct Mol Biol 21, 990-6. Malojčić G*, Geertsma ER*, Brozzo MS, Glockshuber R (2012) Mechanism of the prokaryotic transmembrane disulfide reduction pathway and its in vitro reconstitution from purified components. Angew Chem Int Ed Engl 51, 6900-3. Geertsma ER, Dutzler R (2011) A versatile and efficient high-throughput cloning tool for structural biology. Biochemistry 50, 3272-8. Mulligan C*, Geertsma ER*, Severi E, Kelly DJ, Poolman B, Thomas GH (2009) The substrate-binding protein imposes directionality on an electrochemical sodium gradient-driven TRAP transporter. Proc Natl Acad Sci USA 10, 1778-83. Geertsma ER, Groeneveld M, Slotboom DJ, Poolman B (2008) Quality control of overexpressed membrane proteins. Proc Natl Acad Sci USA 15, 5722-7. Geertsma ER, Nik Mahmood NA, Schuurman-Wolters GK, Poolman B (2008) Membrane reconstitution of ABC transporters and assays of translocator function. Nat Protoc 3, 256-66.